With the likes of Google Glass, Fitbit, and Emotiv wearables are now a familiar concept. Perhaps less known is that animals have been fitted with wearable technology for decades. For example, in the 1960s conservationists fitted endangered species such as gorillas, snow leopards or elephants with radio tracking collars. As research methods improve, laboratory animals are often fitted with wearable monitoring devices rather than more invasive implanted devices. 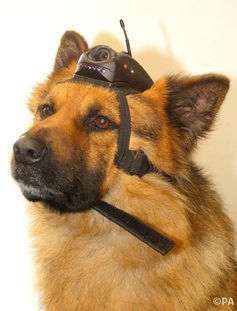 Military or police dogs wear devices that give their handlers a "dogs-eye view" of the areas their animals are patrolling and are even able to transmit commands to the animals . And in modern farming, livestock often wear devices to record their movements and activity as a way of monitoring hormonal cycles or to spot the early signs of possible health problems. These are specialised uses of wearable technology for specific tasks. But in the past decade a new trend has emerged, as wearables aimed at pets have increased in popularity alongside those marketed at humans. We humans seem to enjoy monitoring our every movement or vital sign in a bid to improve our health – and we want the same for our companion animals. There is no shortage of choice. For example, Retrieva is a commercial GPS collar which tracks a dog's location, trajectory and speed in real time, data that is transmitted to a web or mobile phone. It allows the dog's guardian to set up virtual "fences" which alert them if the dog crosses the boundaries. The size of smaller animals is a challenge, but simple GPS trackers such as Loc8tor or G-Paws are available for cats. Marketed as a health monitor, Whistle is a light-weight device which uses accelerometer data to recognise patterns in a dog's activity, for use by the owner or vet. If that wasn't enough, Voyce uses radio frequencies to detect vital signs such as heart-rate and respiration, which together with activity patterns and other information help the dog's guardian and vet understand and improve the animal's health. The system tracks the dog's progress, sends the guardian relevant information and even rates the guardian's care-taking performance. While Voyce is marketed as a revolutionary breakthrough in dog-human communication, perhaps the ultimate wearable device of this sort is NoMoreWoof. 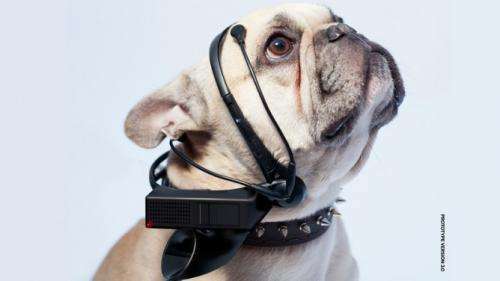 Still in development, this is a canine EEG headset that monitors brain signals and provides suggestions in real time of what they might represent the dog is feeling. In many ways, NoMoreWoof is emblematic of a desire characteristic of this emerging trend, which goes beyond the responsibility of care towards forming a greater bond with these animals, whose language we cannot speak but with whom nevertheless we share our lives and who elicit deep emotions. One wonders what our dogs and cats make of all this. How do they experience it? What does it mean to them? In 2006 researchers at the National University of Singapore addressed similar questions while evaluating a prototype haptic harness for chickens. The harness allowed the human to stroke their chicken over the internet, with the harness delivering a vibro-tactile stimulus to the chicken. To establish how the chickens felt about this, the researchers allowed the hens to choose whether to enter a location where they would be fitted with the harness and found they did so even when it was made harder and harder to access. These are questions that are important to address, particularly if an animal is expected to interact with technology for a purpose. For example, researchers at Georgia Tech developed a wearable harness for search-and-rescue dogs, providing the dog with a means to remotely signal their handler – such as when discovering a casualty – by pulling a tag on the harness. In these cases it's vital that the animal understands at what point and how to operate the device in order to be able to do so when apart from their handler. How do animals conceptualise tracking and bio-sensing devices with which they have no real interaction? At the Animal-Computer Interaction Lab we've found that dogs seem to attribute some meaning to their GPS collars, depending on how they are used. For example they respond enthusiastically to the sight of the collars if in practice it means greater freedom during walks. On the contrary they respond without enthusiasm if the collars are associated with restrictions. What animals make of this technology and their experience of it is partly down to our design of the devices we give them. Any wearable product needs to be driven by user feedback to be successful and, while our animals might not necessarily choose to wear these products, if we really want to understand our animals better through technology then understanding how they make sense of such technology is just as important as the information we gather through it.